Open pores refer to large pores on the skin, in an effort to achieve perfect skin many people try to get rid of their pores. The appearance of pores which are a natural part of the skin can be reduced by our pore tightening treatment. Open pore increases with Acne, Blackheads, Poor skin care routine, Genetic, sun damage and stress to skin with pollution or smoking. Size of open pores is attributed to size of oil glands and hair follicles. Pores cannot be forced to close, disappear or shrink overnight but pore tightening treatments done at clinic like clear lift and peels would be helpful. Certain pore refiner creams also help in shrinking the size of the pores. The Q switched ND YAG pore tightening is quick,painless, highly effective ,does not require a topical numbing cream and takes 15 minutes. Work by penetrating deep into the dermal layer to stimulate new collagen formation which in turn plumps up the skin, tightens the skin and shrinks the size of pore. After the first treatment you may feel the face a bit tighter but noticeable change is seen after 2 to 4 sessions. It takes 6 months for new collagen to be layed so you will continue to see improvent in your complexion and pore size. Someone with photo damaged skin between the age of 20 to 60 where the pore size start to appear larger and more noticeable ,people with large pores due to acne also see improvement. For best results you should come regularly every 3 weekly for initial phase followed by once in 6 months. Wearing a sunblock with aSPF of 30 plus is must as it will prevent any further sun damage from occurring. 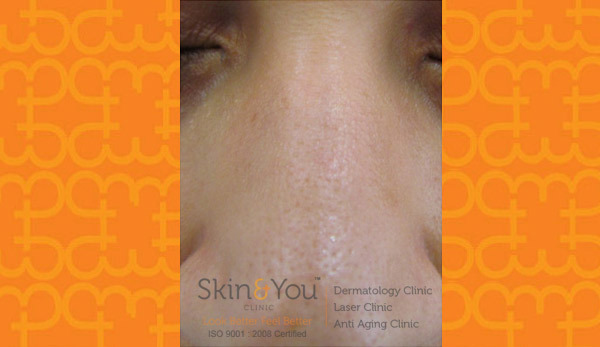 Why Skin & You Clinic For Pore Tightening Treatment? At Skin & You Clinic we are using the safest technology available and delivering results with no downtime or side effects.